Rebekah Anderson, a biologist with the Illinois Department of Natural Resources, had just dropped her phone in the water. There was no real chance of recovering it, but she and Ronnie Brown were peering down, wondering if it could be salvaged, when Brown saw a fish laying in their net close to the surface. They hauled the fish aboard and put it on ice. Anderson was frantic, but there is a rigid protocol for finding Asian carp in these waters, and she followed it: Stay with the fish, take pictures, get coordinates, make phone calls. It was 9:44 am, Thursday, June 22, 2017. One of the first people Anderson called was Kevin Irons, who manages IDNR’s Aquaculture and Aquatic Nuisance Species Program. Irons received the news calmly, hung up, and called the conservation police to arrange for them to pick up the fish. He wanted make sure the chain of custody was documented and unbroken. “We don’t want the fish to disappear,” he said later. “We don’t want to be accused of switching fish.” Irons knew immediately that this eight-pound carp had tremendous power. It could be used to call for hundreds of millions of dollars in government spending, or to invalidate hundreds of millions already spent. It could signal an ecological and economic disaster for the Great Lakes and the eight U.S. states and one Canadian province that surround them, or it could be an insignificant aberration. Such a consequential fish needed exacting stewardship. In the contentious and often fractious discussions over what to do about Asian carp, facts and science are often distorted, and sometimes ignored completely. Indeed, the only thing all sides seem to agree on is that they should not get into Lake Michigan— but how much prevention is enough, at what cost, and whether the fish would even be able to live in the lake—all of these questions remain up for debate. Most media coverage of the subject has “a desired outcome or opinion or direction… generally leading towards one way—towards the inflammatory, the fear” said Irons. Both refrains are based on data generated by Irons’ team, and neither are really accurate. It’s the jumping that made silver carp famous. The fish react to sound, especially the whine of an outboard motor. (Of the various Asian carp species, silver carp are the only ones that jump.) Irons and his colleague Matt O’Hara filmed and posted some of the first carp-jumping videos. The absurd scenes—a carpet of fish seeming to fly out of the water, many apparently aimed at the heads of unsuspecting boaters—spread online with rapidity befitting a fish that can broadcast its eggs by the millions. 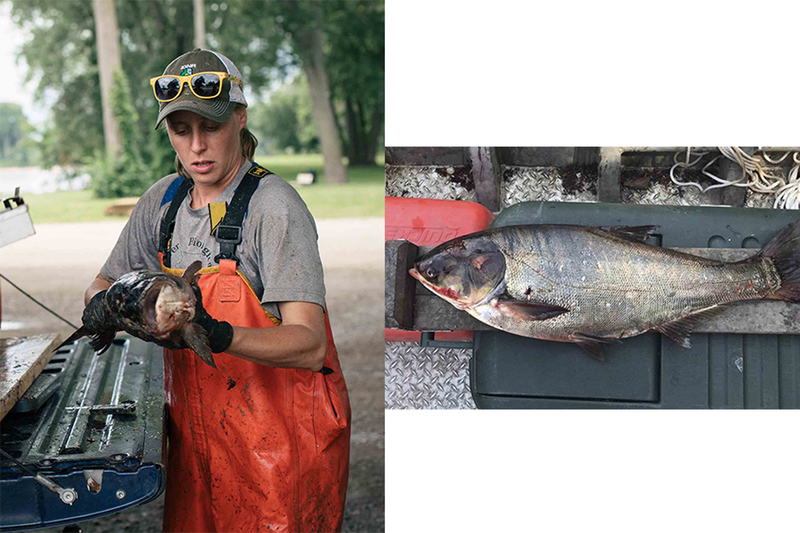 It’s the jumping that caused Asian carp—specifically silver carp, which are the only species that display the behavior—to capture the public’s attention. Most of the funding for IDNR’s carp monitoring and harvesting program comes from the U.S. Environmental Protection Agency, which, ironically, approved of and paid for some of the first Asian carp imported to the United States. (The fish are native from southern China to eastern Russia.) In the 1960s and 1970s, various state agencies, with support from the EPA and U.S. Fish and Wildlife Service, brought Asian carp over to see if the planktivores—bighead and silver carp—could provide a non-chemical, environmentally friendly way to remove algae from wastewater treatment ponds. The initial vector of escape into the wild seems to be Mississippi-connected ponds stocked by the Arkansas Game and Fish Commission, but Alabama’s Auburn University and the Illinois Natural History Survey (where research that led to Kevin Irons’ fishing program began) also worked with Asian carp early on. Once in the Mississippi, the foreign fish could, in theory, go almost anywhere—from the Gulf of Mexico inland as far as Minnesota, Oklahoma, and Pennsylvania, and out through the five Great Lakes to the North Atlantic—because most of the country’s major water bodies were connected to facilitate transportation. There are 18 other potential points of entry where a carp-laden stream might mingle with the Great Lakes. The most probable is near Ft. Wayne, Indiana, but so far the fish seem particularly fond of the Illinois River, which joins the Mississippi River near St. Louis and stretches northeastward, splintering into myriad tributaries and engineered canals with various names and a few narrow fingers that reach the shores of Lake Michigan, including the Little Calumet River where Anderson and Brown’s specimen was found. Often hidden in the headlines is the fact that, of the four species of Asian carp that are of most concern for the Great Lakes, grass carp have already been found in three of them, including Lake Michigan. They’re a threat, but perceived by many to be a lesser one because they eat only plants. Black carp, which feed primarily on mollusks, have been tiptoeing into new territory and raising fears as well. But it’s the bighead and silver carp that have caused the most alarm. They eat plankton, the microscopic organisms at the bottom of the riverine food chain. They are efficient feeders, growing quickly and reproducing voluminously. In the U.S., the adult fish have no natural predators. As their numbers increased, silver and bighead carp ate plankton that would have fed native fish. Though other factors may have also played a role, lower numbers of gizzard shad, big-mouthed buffalo, large-mouth bass, crappie, blue gill, and catfish in the Illinois River correlated with the Asian carp boom. In spite of these fearsome adjectives, the leading edge of the bighead and silver carp population, the last place where the adult fish can reliably be found en route to Lake Michigan, has remained mysteriously static since 1991. During the 11 years between then and when the first of four electric barriers was built on the Chicago Sanitary and Ship Canal, a manmade conduit that connects through a channel to the Calumet at the western edge of the city, only three locks and three dams stood between the carp and the lake. A lock is like a water elevator, allowing boats to travel up or down the height of the dam by floating in an enclosed chamber of water. Traveling upstream from the leading edge to the lake, the first dam a carp would encounter is Brandon Road, about 50 miles southwest of Lake Michigan, in Joliet, Illinois. It is 34 feet high. The second, five miles further upstream at Lockport, is about 39 feet. It would be impossible to swim up either one, but it would be easy, at least theoretically, for any fish to swim with a boat into the chamber, wait for it to fill, and swim out on the other side. From there, an Asian carp could navigate any one of several splintering tributaries and manmade channels that circulate through southern Chicago. It would encounter a final lock at the end of the Chicago or Calumet rivers—and from there could enter Lake Michigan. And yet so far, the bighead and silver carp population has stayed put. Another theory has to do with sewage. The Chicago and Sanitary and Ship Canal was built in 1900 to divert Chicago’s wastewater—tannery spoils, dead animals, human waste, and more—away from Lake Michigan, where the city has always drawn its drinking water. Formerly, the Chicago and Calumet rivers flowed into the lake, while the Des Plaines flowed south. At great effort and cost, with steam power and mules, a canal was carved through the dolomite bedrock to divert the polluted urban rivers away from the city’s drinking water and into the Mississippi-bound Des Plaines. With the divide breached, water from the lakefront and points inland flowed sluggishly south. Aquatic life, ships, and later towboats and other vessels could then travel freely from river to lake and back again. Around 70 percent of the volume of the Sanitary and Ship Canal remains treated wastewater, coming from sinks, toilets, showers, or from rain falling on city streets. Area treatment plants have improved in recent years, but the technology to remove many emerging contaminants—like trace amounts of pharmaceuticals and chemicals from personal care products—would be prohibitively expensive. Three years ago, Jim Duncker, a hydrologist with the U.S. Geological Survey, launched a study sampling water at different times of year from several locations along the Illinois Waterway. He found 638 different compounds. “Everything you see advertised on TV by drug manufacturers,” Duncker said—pain medications, opioids, OxyContin—“it’s all in the water.” Four were of particular interest: Atrazine, an herbicide that can disrupt pituitary and ovarian functions and “induce gonadal malformation;” Metformin, a diabetes medication that can cause intersex and reduced fecundity in fish; Venlafaxine, an antidepressant that can adversely affect predator avoidance; and Citalopram, a selective serotonin reuptake inhibitor-, or SSRI-type antidepressant that can bioaccumulate in fish brains. These anthropogenic bioactive chemicals occurred in abundance right up to the leading edge of the carp population, where they dissipated. Though he can’t be sure that a human-driven pharmaceutical and chemical front is holding back America’s most feared fish, Duncker said, so far the evidence suggests it’s at least a contributing factor. The mouth of the Calumet river (far right pin), is about nine miles from the spot where a silver carp was captured last summer (second from right). And that was well above both the existing electrical barriers designed to repel the carp, near Romeoville, IL (second from left pin), and a new deterrence system planned for Brandon Road Lock and Dam (bottom pin). Pan and zoom the map for more precise detail. After about an hour, officers with the state conservation police arrived. They took the cooler containing the fish, and Anderson filled out an evidence release form. The police secured the carp with an evidence tag and began driving towards Southern Illinois University. At the university, scientists performed a necropsy on the now-famous fish. To determine its age and where it had been, they focused on the otolith, a bony structure in the inner ear, its vertebrae, and bones around the gills called post-cleithrum. 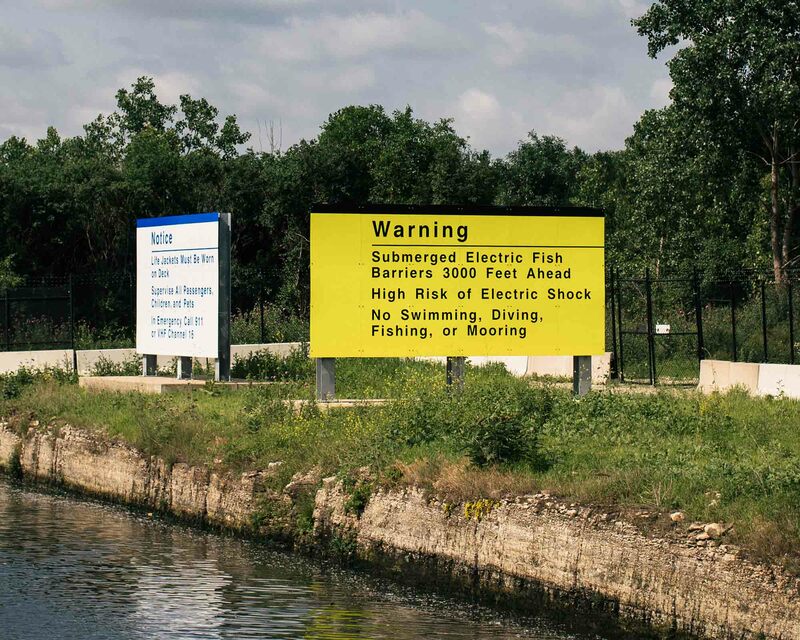 It was unclear how the silver carp got above the electric barriers, but the university’s scientists learned that the 8-pound, 4-year-old male spent the last year of its life in the Des Plaines River watershed, most of which is upstream from the leading edge and some of which is upstream from the barriers. It lived for a few months, at most, in Chicago where it was caught. The university concluded its fish-dossier by saying that the response effort worked as planned and that research continued to suggest that the Asian carp population had not moved. Nonetheless, Anderson and Brown’s catch set off several concentric reactions. According to protocol, the IDNR and many other agencies spent two weeks netting and electro-fishing more than 13 miles of the waterway. More than 20,000 fish were captured during Operation Silver Bullet, but no other bighead or silver carp were caught or even seen. Rippling out beyond Operation Silver Bullet was the rhetorical reaction to the carp capture. Within 24 hours, it was a top story on televisions, radios, and newspapers across the U.S. and half a dozen politicians had commented or released statements. The furor reached the federal House Appropriations Committee, which gave the U.S. Army Corp of Engineers a fresh directive to report back within 45 days “regarding Asian carp proximity to the Great Lakes to determine if emergency action is needed.” Much of the outcry focused on a forthcoming plan recommending a suite of anti-carp modifications to the Brandon Road Lock and Dam, which sits a little less than 40 miles from the spot where Anderson and Brown’s fish was found. 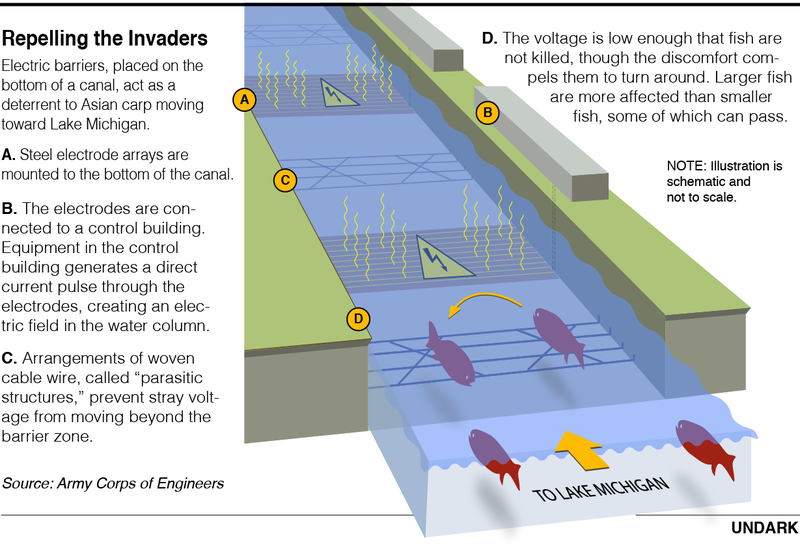 For $275 million, plus operating costs, the Corps proposed to re-engineer the downstream approach channel to the lock, add an electric barrier, water jets, noise cannons, and a lock chamber flushing system—all aimed at defending Lake Michigan from an Asian carp invasion. But the appearance of the tentative Brandon Road plan, made public after Anderson and Brown caught their ambitious fish, only increased divisions and disagreements. One faction, which included the river shipping industry, wanted nothing to change at Brandon Road. Another side advocated shutting the lock down completely. A third, mostly made up of environmental and Great Lakes groups, demanded permanent physical barriers between lake and river. Like Kevin Irons, Jim Duncker’s research could be used to make an argument against Brandon Road, but Duncker doesn’t trust his own chemical-front theory enough to discount the Army Corps’ plan. He thinks stopping those few rogue fish is worth it. Irons said there’s no way the June 2017 carp swam through the electric barriers, but other scientists—who didn’t want to go on the record with an opinion—are confident it did. Typically, the Army Corps requires a local sponsor to share the cost of a federal public works project. Though Illinois’ scientists felt that it might not be necessary to do anything at Brandon Road, the state recognized that other Great Lakes states and the federal government did, indeed, want to do more. In May of 2018, the governor sent a “non-binding” letter to the Corps, agreeing to sponsor the Brandon Road plan and asking to “better understand the underlying scientific justification” behind the project while working diligently to “mitigate our ecologic, transportation, economic, and cost concerns.” For Illinois, “mitigate,” means that the federal government will offset any losses it might suffer as a result of Brandon Road. For example, if the engineered channel slows down shipping, Illinois expects the federal government to make shipping more efficient elsewhere in the state by, say, enlarging downstream locks. The costs Illinois will bear as local sponsor have also been reduced. Normally, the sponsor pays 100 percent of the operation and maintenance costs on a federal project, but language in a bill now making its way through Congress reduces Illinois’ share to 20 percent of the potential $2 million annual cost and, under a plan proposed by Michigan, even that reduced sum will be split between the eight Great Lakes states. With Illinois stepping up as a federal sponsor, the project could be completed by 2025. Though seemingly in agreement now, Michigan and Illinois have been feuding over Asian carp since at least 2009, when the former sued the latter in an effort to shut down two locks within the Chicago Area Waterway System—a vast network encompassing 100 miles of rivers and canals connecting Lake Michigan with the Mississippi River via the Des Plaines and Illinois rivers. The case went to the Supreme Court, where Michigan’s petition was denied, but efforts to close the waterway persist. On a bright Tuesday morning, the management of Illinois Marine Towing sat around a table at their headquarters, beside the Sanitary and Ship Canal in the industrial suburb of Lemont. Located just a few miles north of the electric barriers, IMT is one of four main companies moving bulk cargo by barge through the Chicago Area Waterway System. There was a consensus around the table that day that both the public and the government overreact to Asian carp. Marine superintendent Mike Blaske compared them to zebra mussels, one of more than 180 non-native species already established in the Great Lakes. The mussels were initially transported in ship’s ballast water, from Western Asia and Eastern Europe to the Great Lakes. In the 1980s and 90s, they entered the Mississippi River watershed and spread through the American interior. They clogged water intakes, harmed native bivalve populations, and ate so much plankton that the Great Lakes went from murky to crystal clear in many places. Though ecologically devastating, zebra mussels didn’t attract much media attention nationally. They live below the water’s surface, Blaske pointed out, whereas silver carp jump and threaten physical harm to boaters. That’s why there’s a disproportionately “huge focus” on this particular fish, he said. Environmentalists imagine that “these things are stacked up at the locks 10 feet deep” waiting to burst through “and just flood the lakes and destroy everything,” said Blaske. In fact, the leading edge remains three miles below Brandon Road, 14 miles below the electric barriers, and 47 miles from Lake Michigan. In a public statement last September, IMT president Delbert Wilkins said there was no scientific basis for concluding the June 22 carp passed through the barrier. He called the Brandon Road plan a “solution looking for a problem” and said more attention should be paid to the threat of Asian carp moved deliberately by humans, which he called “eco-terrorism.” Wilkins has since shifted his position, however, saying that the company is in favor of the plan “so long as new technologies are vetted and that there are no hazards to mariners.” That support comes provided that the plan “does not preclude safety while allowing uninterrupted or unimpeded commercial navigation,”—the very issues the shipping industry’s initial objections focused on. As the scope of the carp invasion became known in the late 1990s, Congress passed legislation instructing the Army Corps to prevent “aquatic nuisance species” from reaching Lake Michigan. The Corps chose to build an electric barrier system across the Chicago Sanitary and Ship Canal at Romeoville, Illinois. The barriers, the first of which began operating in 2002, deliver a maximum of 2.3 volts per inch at the water’s surface, pulsing 34 times per second, and collectively electrifying about 300 feet of water. According to Chuck Shea, the Corp’s barrier project manager, it would be very rare for the electricity to kill a fish. Rather, as they swim closer, they become so uncomfortable that they turn around before getting hurt. The effect of the barriers on humans would depend on a person’s size and mass, along with other factors, said Shea, but it “could be fatal.” The rapid pulsing can interfere with the heartbeat and lead to muscular paralysis. Under U.S. Coast Guard policy, if a mariner falls in the electrified water, they cannot be touched until the barriers are turned off or they’ve moved down river. When finished in 2021, the electric barriers at Romeoville will have cost tax-payers $268 million, plus $15 to $20 million per year to operate and maintain going forward. (This does not include the $275 million price tag for the Brandon Road project.) Though it is automatic and runs constantly, the Romeoville barrier system has a staff of eight during business hours (and on call at other times) and one on nights and weekends. It is not known how many, if any, Asian carp have encountered the barriers. In all the monitoring since its construction, there has never been a documented sighting. The Albert C passed a fish surveyer with the Illinois Department of Natural Resources. “He’s been pulling up a lot of net and I haven’t seen one fish go through,” said Blaske. The specter of a complete shutdown of the waterway, though defeated in 2010 when the Supreme Court refused to hear Michigan’s request to close the two locks closest to Lake Michigan, gained strength after the June 22 carp-catch. River shippers like IMT say the consequences would be catastrophic: Millions of tons of fuel, steel, grain, sand, and concrete transit the waterway each year, and a closure means that those commodities would have to travel by road or rail, vastly increasing costs and adding exponentially more traffic to highways and train tracks that already rank among the nation’s most crowded. At the same time, Geertsma admitted that fears of Asian carp invading the Great Lakes are often exaggerated. It would be “horrible” if carp became established in the lakes, because they would out compete some native fish, Geertsma said, but there’s “still a big question” as to whether they would thrive or even survive in Lake Michigan’s relatively cold, nutrient-poor water. This doesn’t change the fact that, according to the NRDC’s analysis, very little is shipped by water between Chicago, or points south, and Lake Michigan. Some materials move to and from the city by barge, but most of the tonnage that is recorded transiting Brandon Road, for example, is destined for industrial areas south of Chicago. Walling off the waterway further north, Geertsma argued, would not block a “robust throughway of commerce.” She thinks the economic impact would be much less than barge advocates claim. These and more strident sentiments were on full display at a public meeting in September, convened by the Corps to get feedback on the Brandon Road plan, in Muskegon, Michigan— 120 miles as the fish hawk flies across the lake from Chicago. Many of the Michiganders feared that Asian carp would destroy broad swaths of their livelihood. As each person stood up to speak, the value of what was at stake seemed to rise: from $7 billion for the Great Lakes fishery, to $26 billion for Michigan’s outdoor recreation economy, to $62 billion for wages derived from Lake Michigan in that state. Substantial applause went to advocates of “total separation” and “lock closure.” Several comments verged on hysteria. One person connected the Asian carp threat to immigrant farm workers, lack of sanitation, and even E. coli. Conspiracy theories notwithstanding, a serious effort exists to reestablish the Lake Michigan and Mississippi watersheds. The Great Lakes Fishery Commission, Michigan Environmental Council, the states of Minnesota, Pennsylvania, and Michigan, the NRDC, Michigan Democratic Sen. Debbie Stabenow, and a host of alliances and coalitions all favor separation in some form. Another group, the Great Lakes and St. Lawrence Cities Initiative, published this faction’s manifesto, called “Restoring the Natural Divide,” in 2012. Shipping, sanitation, and flood control are the three most enduring functions of the area’s highly engineered system of rivers and canals, and the most expensive and difficult aspects of undoing it. If physical barriers are placed within the Chicago Area Waterway System, a portion of Chicago’s sewage system would have to be re-plumbed and the city’s wastewater treatment plants would have to be retooled to process water to much higher standards for discharge into the Great Lakes. The physical barriers would also disrupt shipping. The Initiative’s paper proposed trans-loading facilities on the barriers, where cranes or other equipment would unload barges on one side and re-load them on the other. But by any estimate, restoring the divide would cost billions of dollars. “The conversation about complete separation is divisive right now,” said David St. Pierre, executive director of the Metropolitan Water Reclamation District of Greater Chicago, which oversees sewage infrastructure and treatment plants, as well as maintains water levels in the Sanitary and Ship Canal. Most separation scenarios, none of which St. Pierre views as realistic or viable, would require a substantial reengineering of the District’s infrastructure, with implications for flooding and water quality in the waterways and the lake. When it comes to finding solutions, he sees the environmentalists and the barge industry retreating to their ideological corners, with an unwillingness to compromise so entrenched that he compared it to religion. Kevin Irons and his colleague, Matt O’Hara—also with the Illinois Department of Natural Resources—glided across a muddy, opaque stretch of Illinois River near Starved Rock State Park and stopped beside Tracy Seidemann’s boat, where a 1200-yard net was being handed aboard. A silver carp was tangled in the net about every five feet, and when the deckhand got to one, he hooked it through the eye. Holding the muscular, hydrodynamic fish aloft, he carefully peeled the monofilament down around the body and tail. The pinkish net, strung with small floats and heavier black line, piled up in the boat’s forward compartment. The carp piled up in the middle, where they grew darker in the sun. Seidemann, a commercial fisherman, stood in the stern, backing slowly on his 200-horsepower Suzuki. A biologist with the IDNR tallied the catch on a blood-spattered clip board. On average, the ratio of Asian carp to every other kind of fish that day was five to one, though the gear and location were both optimized to target carp. Irons and O’Hara have been monitoring carp in the Illinois River since the 1990s, when a day of gill netting would come up with one or two. Beginning around the year 2000, their nets started coming up with hundreds. In 2010, they began “harvesting” on a large scale using commercial fishermen. While a lot of people do a lot of talking on the issue, Irons’ and O’Hara’s team is widely considered to be the only one doing anything about it. They remove upwards of 1 million pounds of carp from the Upper Illinois River each year, while commercial fishermen downstream can bring in 3.5 to 8 million more. Yet still, in some places, 75 percent of the river’s biomass—meaning the aggregate of all organic material—is Asian carp. Irons draws hope from the story of cod, which were hunted across the vast Atlantic Ocean to the brink of extinction. “I think it’s really possible to use fishing as a strategy to, probably not eradicate, but get us to a more comfortable place,” reducing the risk to the Great Lakes and freeing up plankton for other fish, he said. Irons’ program is showing results: between 2012 and 2014, scientists documented a 68 percent decrease in Asian carp populations in the upper reaches of the Illinois River. In 2017, Irons said, this number was approaching 93 percent in the stretch of river below the leading edge. But to keep the population from climbing back up, the harvesting program needs to continue —forever—at a cost of $1.2 to $1.6 million dollars per year, though Irons says the costs could shrink if fishing intensifies downstream. So far, the bill has been footed by U.S. taxpayers in the form of grants from U.S. EPA and the Great Lakes Restoration Initiative, but federal funds are annually subject to politics. President Trump’s 2019 budget proposes a 34 percent cut to the EPA. If Irons’ program and others combating Asian carp were to lose their funding, the population would quickly rebound. Before long, bigheads and silvers would overwhelm the leading edge and truly challenge the electric barriers. Seidemann, a big man in his mid-40s, smoked cigarettes and had a snapping turtle tattooed on his sunburned arm. He had been working with Irons for 8 years. At best, he said, he could make $1,000 per day fishing his home waters near Savanna, Illinois, catching common carp, buffalo, and catfish for the retail trade. He makes more money—$85,000 to $100,000 per year—working five days a week, 24 weeks a year for the IDNR, netting fish that would have wasted his time before. As the sun reached its early-June apex, the carp in Seidemann’s boat went from ankle-, to knee-, to thigh-deep. Worldwide, no fish is farmed in greater numbers than Asian carp, but the U.S. market for it is comparatively small. An Illinois company called Schafer Fisheries says it sells 10 to 15 million pounds annually, 30 to 40 percent of this domestically. Mike Schafer, the company’s owner, said that the IDNR fishing program has actually hurt his business. “IDNR has employed a lot of our fisherman away from us,” he said, “so we don’t have continuity of supply.” For him, the millions of dollars spent on Asian carp controls is “a fiasco”—government paying government at the expense of the private sector. While Irons’ boat was alongside Seidemann’s, he recalled the tasty carp hotdogs that Schafer briefly made. Then he told Seidemann and the other commercial anglers about a place in Kentucky paying for fresh Asian carp, brought down on ice. They didn’t seem enticed. The IDNR doesn’t maintain food quality fish, so every couple of days, Irons’ team fills a 53-foot truck with about 40,000 pounds of carp. A load last summer went to a fertilizer company in South Dakota called Holy Carp, but some truck loads end up in landfills. Still, Irons is hopeful that Illinois can turn that surplus into something profitable, and in turn find a free-market solution to the Asian carp threat. Such a solution would already exist, Schafer claims, if government resources had been focused on this idea a decade ago. According to him, catching, selling, and eating, is far simpler and far cheaper than electrified barriers or disruptive concrete walls. In the last days of 2017, Irons and O’Hara were at the University of Illinois at Urbana-Champaign, which operates the largest nonmilitary dining center in the U.S. and has an even bigger one planned. Chef SooHwa Yu entered the room bearing a platter. On a bed of wilted greens, garnished with green onions, parsley, and cilantro, and tossed with soy sauce and sesame oil, lay a bighead carp fried Cantonese-style. A thin white line of jaw bone protruded from the brown fry batter. But Asian carp fillets are layered with thin L and Y shaped bones, so labor intensive to remove that boneless fillets cost $10 per pound. At that price, Smith said, “You might as well go for swordfish or salmon.” In 2016, the university experimented with using ground Asian carp in chowders and tacos. In March 2017, they served it bone-in for the first time. They were amazed: Students didn’t seem to care about what, until then, was considered an insurmountable barrier. Irons explained that Illinois spent $1 million dollars on a marketing study aimed at developing a commercial Asian carp fishery. Longer term, the state is looking for $32 to $40 million from the federal government. Spent over seven or eight years, Illinois says this will be enough to make that industry self-sustaining. Currently, most processors pay $0.10 or $0.15 per pound for bigheads and silvers, Irons said, so fishermen throw them back. Illinois is hoping to find a way to raise the price to $0.20 to $0.30 per pound (which Schafer says he currently pays for grass and bighead carp.) At those rates, Irons hopes it will be more profitable to catch Asian carp by the ton. Until then, the mere existence of a bighead or silver carp population lurking somewhere in the riverine landscapes around the Great Lakes—and most certainly the mysterious appearance of any Asian carp that manages to breach the garrisons designed to keep it at bay—will stoke bitter debates over what more, if anything, can or should be done about it. Tyler J. Kelley is a freelance journalist based in New York. He is currently working on a book about inland waterway infrastructure.